There are many ways to share images and media across the net and cineSync tries to take an original approach to doing so. cineSync enables multiple people in different locations to review visual media. This means that whatever is playing on the host screen, will be seen in sync by all those sharing it at exactly the same time. i.e. synchronized video playback across everyone's screen. Alternatively, it's suitable for those that want to share drawings and sketches in real time over the net and it includes support for Wacom tablets. When you open cineSync, you're asked to either join a session or sign-up for one that already exists. To start your own, you will need a username and password which you'll have to sign-up for on the cineSync website. Otherwise, all you need is the key from someone hosting a meeting for you to join. The handy thing is that by clicking on Notes in the bottom left, you can take notes on what you are watching - useful for meetings - and the notes won't be shared by anyone else who is viewing at the same time. However, there is no way you can broadcast your own voice over cineSync so it's strictly for sharing media only. 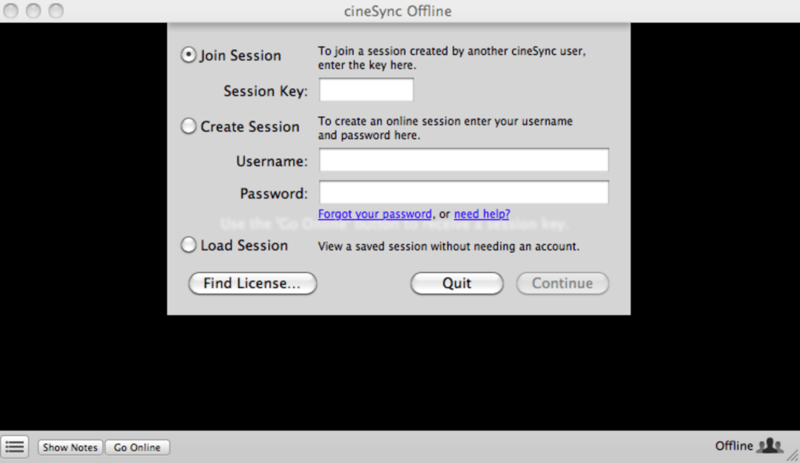 cineSync is a simple way of sharing media in real-time with multiple users and taking notes at the same time. cineSync enables multiple people across the world to efficiently review visual media, from static images to movies. With cineSync, what you see is what others see: experience synchronised movie playback across everyone's screen with frame-accurate precision. Share your vision by simply drawing on the screen with your mouse, like a real-time shared whiteboard (with full support for pressure-sensitive Wacom tablets). What do you think about cineSync? Do you recommend it? Why?